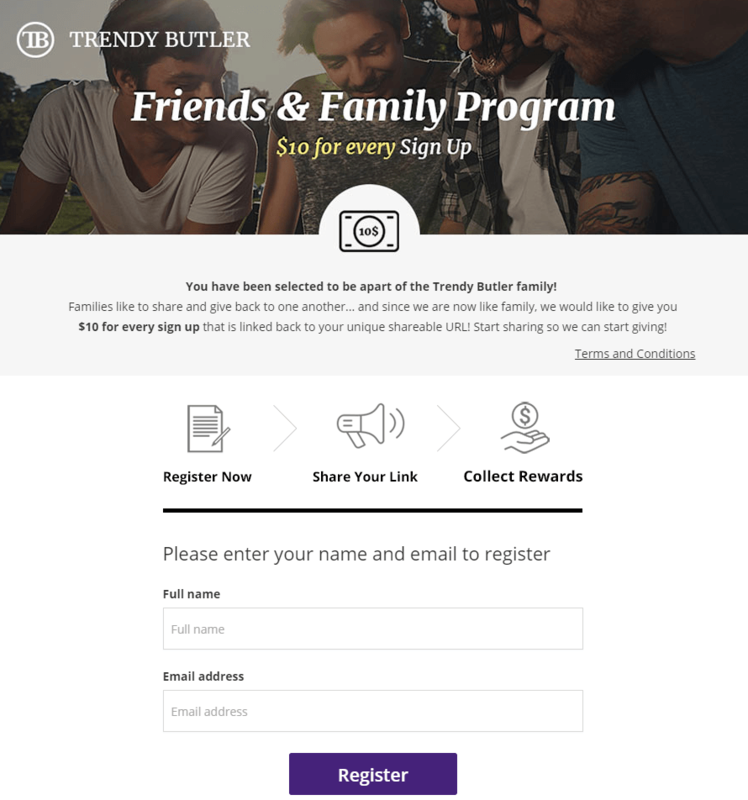 Landing pages can be one of the most overlooked aspects of a successful referral program. Here are some ideas on how to create an awesome landing page. One of the most overlooked items of a referral program is the landing page. You have thought about all aspects of your referral program in great detail. Now you need to figure out how you’re going to display the program. You may be wondering what components you need to have a successful landing page. Once you have the program details figured out you need to design how it will look. You want your landing page to be appealing, convenient and informative. The landing page will either make someone want to sign up or it will make them run. If something looks confusing, boring or difficult, chances are the user won’t respond well. The user will exit without giving it a second look. There are a few key ingredients that will help you create the perfect landing page for your program. 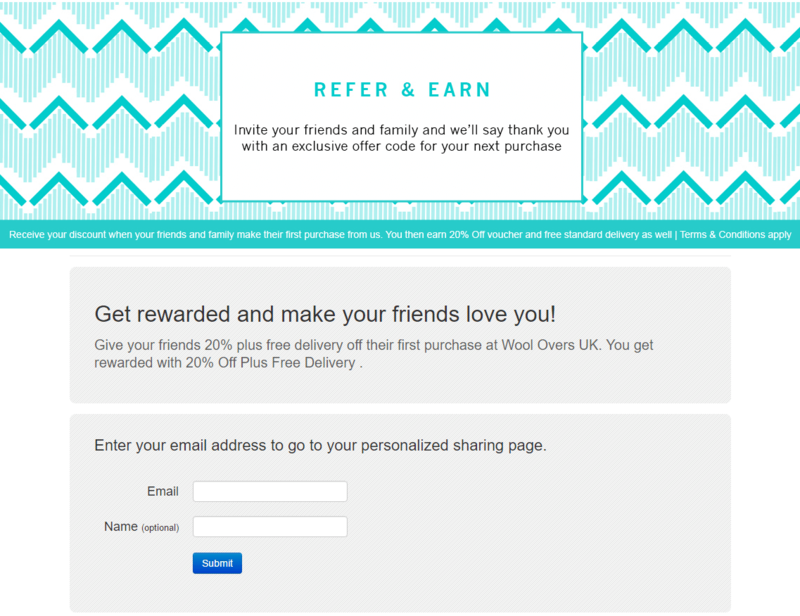 What are the instructions for crafting the perfect referral program landing page? People don’t select things that have lackluster names. Catchy things trump all. The same goes for your landing page. If you don’t “WOW” someone, they will not explore the page that long. This is the first thing someone will read when they land on the landing page. So make the headline intriguing so that the user wants to read more. Is it simple? Make it easy for potential users to understand. Is it uncomplicated? Complicated and gimmicky make it less appealing to customers. Is it applicable? If it’s not relevant to the user – chances are they won’t be interested. Do you need help creating a catchy headline? Here are 5 easy tricks to write catchy headlines, by Jeff Goins. Make sure you follow him on Twitter @JeffGoins. Here is a good example of a simple yet catchy headline. Trendy Butler gets right to the point with what this landing page is all about. Plus, they mention the purpose of the page. Boom – (the What) “Friends and Family Program”. Bam – (the why) “$10 for every sign up”. They kept it simple, uncomplicated and applicable to their customers. Navigation to your landing page is essential. If your users have a hard time navigating to and from the page, well things might crash and burn. Your best bet is to be simple and visible. You may opt to have your referral program as its own option on your navigation menu. Or it may perhaps be a secondary option. Is it over the top? Yes, you want it to be noticeable, but remember it’s not an attraction at the zoo. You still want your main content to be seen. So, blinking lights are not necessary. Is it confusing? From now on, just note that things need to be simple. Always. Navigating the landing page or your site, for that matter should not be confusing. If it is, then you can kiss conversions goodbye. 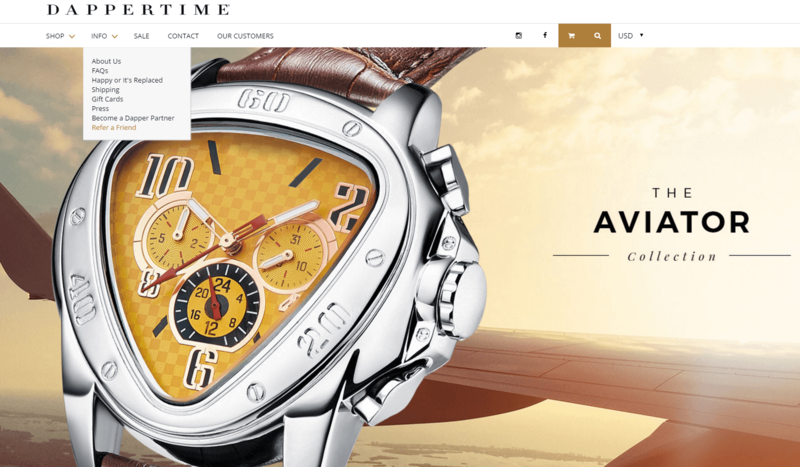 Here is a perfect example of landing page navigation (or navigation to get to the page). Dappertime places a link to their referral program page right on their main site menu. This will allow their customers to easily find the landing page, and take action. They make sure it’s findable without being over the top or confusing. You need a hero shot. You need one main image that will impress and explain the purpose of the landing page. This image is not meant to be a bystander on the page – it’s supposed to take center stage. The sole purpose is to use this one image to tell the story. Or give off a particular feeling (i.e: happiness or excitement are good things to aim for). This image will explain what words are unable to. Sure, you can use other imagery – but don’t let things get too cluttered. Is it relevant? Make your images do the talking for you. If you’re a cupcake shop, you may not want to use a burger as the hero image on your landing page. Unless you can somehow make it relevant to you, steer clear. Is it gripping? It’s called a “hero image”. This image needs to help catch attention. Pair a great, clear and meaningful image with an awesome title, and you’ll be all set. A stunning example of imagery. 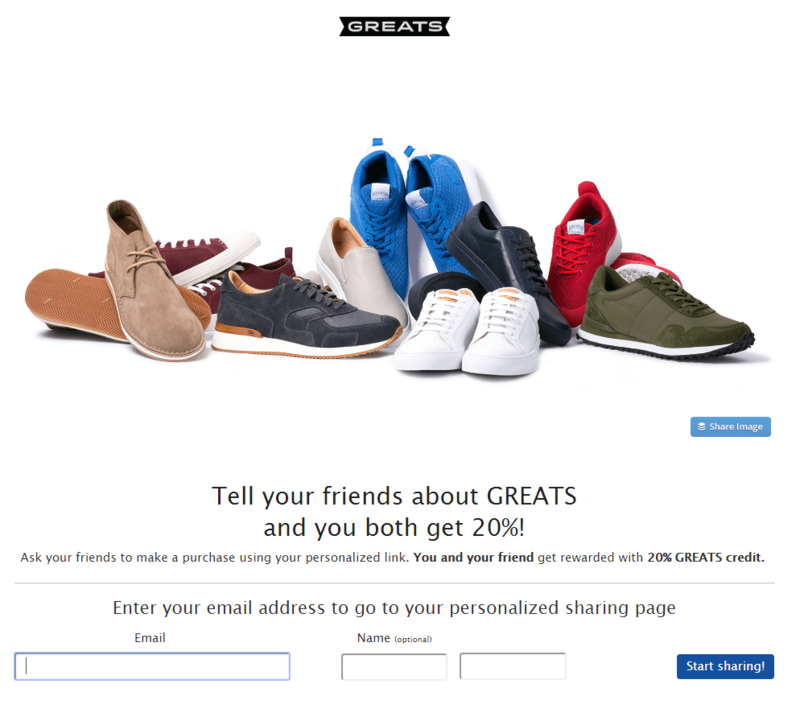 Greats referral program landing page looks clean and sharp. Plus, they used a killer hero image that displays what they’re all about. They display the image right above their text, and voilà, it’s easy to follow along with this landing page. You need something that lets the user know what their next move should be. Take the guesswork out of it by using a clear call to action. The call to action should be an actionable word, that also informs the user of what they are about to do. “Register”, “Sign Up”, “Earn Now” are simple, yet effective CTAs. Is it insightful? Make sure the user has a clear understanding for what they are clicking on. Is it catchy? The CTA button should stand out. Again this doesn’t mean light it up like the Hollywood sign. It just means that the button needs to be clear and visible. Is it findable? CTA placement is important. If it’s in a weird location, people may glance over it. If you are using a scrolling page and it’s located at the bottom, after 6 pages of content, it may never get clicked. The CTA is important, it’s how you convert your users into your program members. (Note: If you do have a long scrolling page – have a CTA in many locations. Try on or under the Hero Image, at the bottom of the page, on the side as a static option). No matter where you may place your CTAs, they need to make sense and be visible. Do you need more help mastering your CTA? Check out this article by Ott Niggulis (also find him on Twitter @OttNiggulis). Let’s see an example of a good CTA. True&Co hits the nail on the head quite well. The CTA is clear. It’s placed in a findable spot. Plus, it’s catchy – not to mention it’s gold! Who doesn’t want to press a golden button? This is your opportunity to convince the user to sign up. Your landing page should give a clear sign why signing up for your program will benefit them. Describe the benefits in the most interesting way possible. Make it so the user knows exactly why they should sign up. Is it compelling? Make sure the user can understand how signing up will benefit them. Is it descriptive? Make sure you’re not just slapping the features down. Explain the benefits. Is it wordy? Yes, you want it to be descriptive, but keep things to a minimum. When things get too text-driven, the user may lose focus. Need an example of good benefits? Wool Overs does a great job at explaining the benefit of joining their referral program. They use a short blurb to explain the benefit right under the headline. Wool Over keeps it short and sweet, but also informative. Make sure that whatever imagery, wording, or CTAs you use, the user knows exactly what the purpose is. You want to make the user confident in their decision and you want to avoid accidental clicks. You’ll also find that a lot of these rules apply to your referral message (which can be a landing page in your program too). To see other awesome referral programs, click here. Are You Ready to Launch a Referral Program?